SEATTLE – The rate at which Americans die from cancers varies dramatically by where they live, according to a new scientific analysis. Lung cancer kills more people in the United States than any other cancer, but death rates are more than 20 times higher in some parts of the country than others. The nation’s highest death rate from lung cancer in 2014 – the latest year included in the study – was in Union County, Florida, at 231 deaths per 100,000 residents. The lowest death rate from lung cancer was in Summit County, Colorado, with only 11 deaths per 100,000 people. Similar differences were seen across cancers among more than 3,000 counties and cities in the US. The study, “Trends and patterns of disparities in cancer mortality among US counties, 1980–2014,” examines 29 types of cancer, analyzing mortality rates and how they have changed. It was published in the January 24 issue of JAMA. In the 35 years examined, more than 19.5 million Americans died of cancer. The national mortality rate from all cancers combined fell by 20%. Despite this trend, 160 counties showed increases in all-cancer death rates over the same period, raising questions about access to care, prevention efforts, treatment, and other issues. 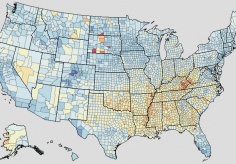 Liver cancer mortality increased in nearly every county. Clusters of counties with large increases were found in California, Oregon, Washington, New Mexico, and Texas. While alcohol is a well-known risk factor for liver cancer, the counties with high or increasing death rates differ from those known for high rates of alcohol consumption. Fewer Americans smoke today than in previous decades, but parts of the South and many rural areas still show high rates of this deadly habit. It is not surprising that these same areas show high rates of lung cancer, especially within states like Kentucky, Tennessee, Alabama, Missouri, Arkansas, Mississippi, and rural Alaska. More aggressive efforts to discourage smoking in these areas are crucial to help address this problem. The majority of counties witnessed decreases in breast cancer death rates since 1980; however, there are clusters of high mortality rates in counties along the Mississippi River. The lowest rates appear in parts of the West, Midwest, and Northeast. There are high death rates from prostate cancer in groups of counties in Alabama, Mississippi, Georgia, South Carolina, and Virginia. Counties with the highest death rates from kidney cancer also were identified along the Mississippi River, as well as in Oklahoma and Texas. In addition, certain areas in Alaska and the Dakotas with large Native American populations showed rates higher than the national average. “It is essential that state and local health officials, as well as other health policy decision-makers and cancer care advocates, take note of and act on this important evidence to save more lives in their communities,” said Dr. Christopher Murray, Director of IHME. Dr. Murray and the other authors suggest several potential explanations for high rates of cancer mortality in particular areas. Known cancer risk factors – smoking, diet, and obesity, among others – combined with poor prevention programs may increase cancer cases. Additionally, lack of early detection for some cancers and lack of specialized treatment can be deadly. To allow the public access to these findings, IHME has updated its US Health Map data visualization tool and county profiles, and new downloadable spreadsheets have been added to the Global Health Data Exchange (GHDx).